The Samsung U28H750 is an upcoming 4K monitor for users who want improved colors and a massive viewing space without a hefty cost. The success of these types of products come from their excellent value per dollar ratings, so it is safe to say that the Samsung U28H750 could be the next UHD star of its price bracket. And honestly, from the way the specs sheets and picture look, this model looks like a contender for your hard-earned money. 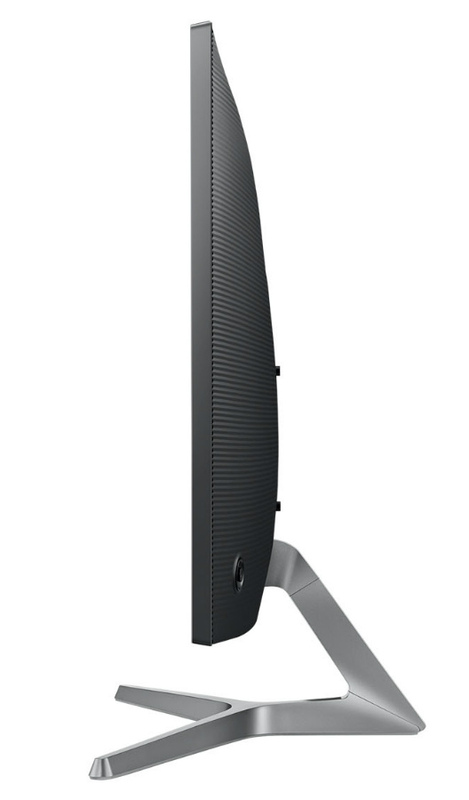 The Samsung U28H750 looks quite fine thanks to its matte black and gunmetal finish on the bottom strip and the stand. The bezels appear reasonably thin at more or less 10mm, giving way to the 28-inch screen. The rear of the cabinet has a matte black ribbed surface reminiscent of how Samsung designs their latest televisions. The I/O layout takes up a small portion of this space, and it includes what looks to be a cover to hide the receptacles while a small hole allows cables to pass through. We love this setup since it allows for convenient cable management to match the streamlined looks of this monitor fit for a meticulously neat desktop. The layout is quite simple; you only get a standard DisplayPort 1.2 and two HDMI 2.0 slots along with a 3.5mm headphone jack. The HDMI slots should allow users to connect a 4K-capable console like the Xbox Scorpio or the PS4 Pro. Having these options allow future owners to use the Samsung U28H750 as an all-in-one display to maximize space and energy consumption. Samsung’s JOG button or multidirectional joystick for OSD navigation is also present. This nifty tool is a welcome addition to this midrange monitor since it was previously only found on high-end offerings. You don’t see any buttons peeking out from the sides or buttons, enhancing the sleek lines of this product. Finally, the angular metallic stand looks stable and over designed even for a 28-incher, so we think the Samsung U28H750 will stand firm on any surface. One caveat we can quickly determine is that this mechanism can only offer tilt for ergonomics, but you do get VESA compatibility for mounting purposes. 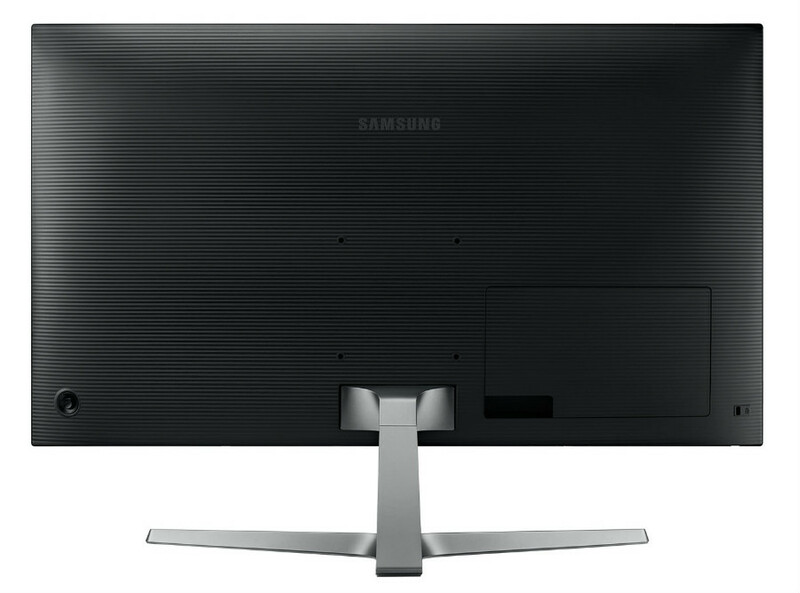 The Samsung U28H750 features a 28-inch TN panel with Quantum Dot backlighting and a 4K UHD native resolution. As advertised, this screen has a maximum brightness of 250 nits, a refresh rate of 60Hz and a response time of 1ms making it ideal for games. The panel most probably is a newer version of the 28-inch TNs we see on previous models with similar specs, but the difference this time around is the addition of Quantum Dot backlighting. The tech allows Samsung’s products to extend its color and contrast vibrancy and uniformity. The Samsung U28H750 declares that it has a 10-bit interface which allows 1.07 billion colors, but we suspect that it reaches this by utilizing FRC Dithering. Putting together this combination of specs makes it possible to predict that this model will produce with enhanced saturation levels when displaying sRGB content, despite having the limitations of TN technology. Unlike its predecessors, the Samsung U28H750 is now compatible with AMD Freesync. Although the working range is yet to be determined, we think this model will have a maximum coverage of 60Hz which makes it excellent for games with intense graphics. You also get Picture by Picture and Picture in Picture modes to display images and video from two different host devices, eliminating the need for a secondary display. The latter allows granular resizing and positioning, so you can adjust the secondary input according to your needs to maximize productivity. Finally, the Samsung U28H750 is rich in features since it includes multiple presets which cater to different preferences. The most notable are the Eye Saver Mode and Warm 2 color preset, both of which reduce blue light to help keep your eyes safe from strain during extended use. The Samsung U28H750 offers specs worthy of consideration in the modern era of monitors, but these features are nothing new. The new look this product has makes it enticing for contemporary enthusiasts, but what makes it all the more tempting is its $400 SRP (Suggested Retail Price) when it launches. The Samsung U28H750 is expected to be available in the coming weeks, adding to the list of fantastic monitors any consumer can consider for the best price to performance ratios. If you want to know more about this product, you can consult Samsung’s website or check our links for pricing and availability. I want to use this for gaming, the LG has a 5ms, where the Samsung as a 1ms. Do you still say go with the LG? Hi, Jeff! The pixel response times specified by all monitors are inaccurate, but 1ms usually denotes a TN-type display. TNs will always be faster than IPS and VA, but this matter less if you are looking for the best color quality. Hi, I have xbox one x (scorpio) and I have to choose between Samsung U28H750 ans LG 27UK650-W 27. I am aware that the LG had a IPS panel and Samsung has a ton panel. Can you help me with which one I should buy ? Hello, Adi! The LG will look better in every way. Cheers! Hey, I am considering the Samsung U28H750 and the Dell U2718Q, price is almost the same, which one do you think is best? Hi, Eddy! It’s mainly VA or IPS between the two. 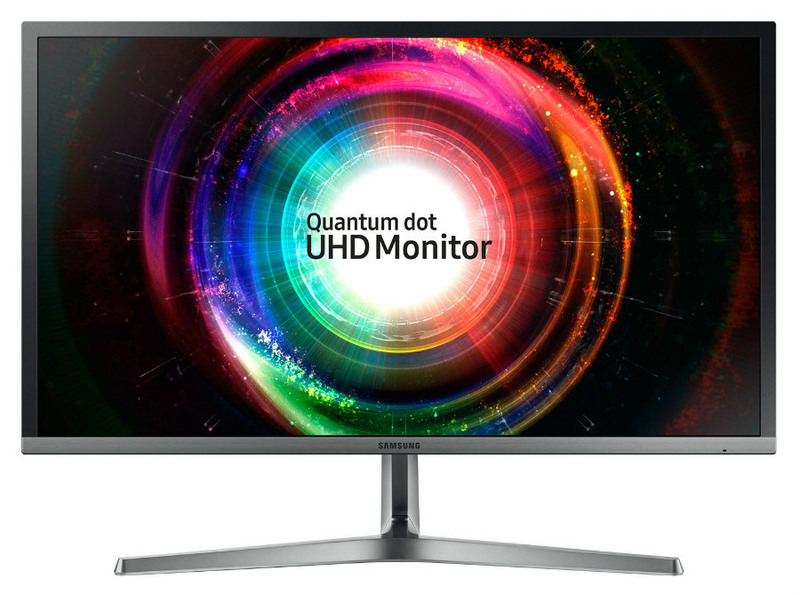 The Samsung U28H750 has Quantum Dot tech for richer colors, while the Dell U2718Q has a simulated HDR feature. Considering these factors, the Samsung U28H750 is the better buy. Hi, I am looking to buy either this Samsung U28H750 or the Asus MG24UQ for a PS4 Pro. What would you recommend out of the two? Hey, Pete! The Samsung U28H750 is a better option for eye candy since it includes Quantum Dot for vibrant colors and is bigger than the MG24UQ. Is this monitor good for a laptop with a nvidia 1070 gpu with no displayport and running an xbox one x for 4k gamming. Hello, Paul! As long as your laptop’s HDMI output is version 2.0, there shouldn’t be an issue with 4K gaming. The Samsung U28H750 includes two HDMI 2.0 ports, so your lappy and Xbox are covered. Cheers! Ciao, Simone! Sì, gli slot HDMI supporteranno 4K 60Hz poiché sono la versione 2.0. Hey, Patrick! We have not yet tested the Samsung U28H750 with the Xbox One X. You can check this guide out and scroll down to the HDR monitor options below. Cheers! Does this have built in speakers? Can’t see it mentioned? Hi Steven! Thank you for coming to Monitornerds. TRhe Samsung U28H750 does not include speakers, so you might need to use a headset or a separate CP speaker system. Hope this helps!